CUSTOM – A success story in innovation, technology and vertical markets. Custom was founded 20 years ago by its current President, Carlo Stradi and Director of Research and Development, Alberto Campanini. 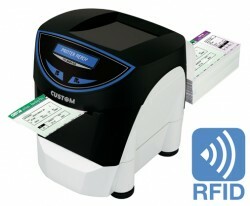 Today Custom is a leading company in Europe and among the top world leaders in the realisation of systems and printing solutions for receipts and tickets so called “Mechatronics”, where Mechanics and Electronics are integrated: a cash register, a fiscal printer, a travel document printer (airline, rail and boat tickets) or admission tickets. Custom operates in several vertical markets including the automation of cash points, supermarkets, restaurants; ticketing and receipt automation services; in the industrial production of electronic measuring and control devices that require printing reports; in the lottery and betting sectors. The company has always been focused on understanding client needs and market requirements, providing customised solutions and ensuring high standards of assistance and service. It has been able to significantly grow in the last 5 years thanks to its constant attention to the market developments foreseeing the trend; this thanks to the large investments in research and innovative technologies which allowed us to be flexible creating specific solutions. KPM302H prints on ticket width from 20 to 82.5mm, with paper thickness from 80 to 255gsm. KPM302 H has Ethernet interface with integrated web server that allows remote monitoring for complete diagnostics in real time of the printer’s status. It is also possible to install applications, updates and configurations in real time through the web! 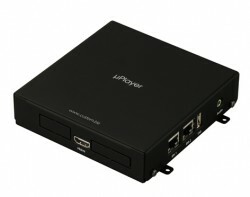 Custom MicroPlayer is able to distribute videos, images, web pages on a TV/monitor with HDMI input at HD resolution! Each MicroPlayer can pilot a TV/monitor and it’s predisposed to be connected to the web for the remote management of contents. It’s available an internal 1.2 GB memory and it’s also possible upload and update quickly multimedia contents through additional SD card, up to 16 GB. Thanks to the “MicroPlaylist Manager” software, it is possible to configure the contents remotely through an Ethernet connection, and then play them as you wish in a preset order. Using a timer function, you can also programme the viewing of an event at a set time or day. If, for example, a bar with a Microplayer wants to show a football match for its customers on a given day, it can programme this and various other contents, such as sliding messages containing promotional offers, information on future appointments, discounts and even news flashes related to the event being shown. B202H is a sturdy and compact ticket printer suitable for parking, public transport, event box offices, theme parks, health care provider. B202H also prints on thermal wristband for theme parks and hospitals. 2D barcodes and True Type fonts , any language available. It prints on different ticket widths from 20mm to 54mm. B202H comes with a suite of software for remote status (Status Monitor Driver) for getting the status back all-in-one with your application and RFID setting software. TK302 is the most advanced ATB and BT ticket printer in the market for applications requiring durability and latest technologies. 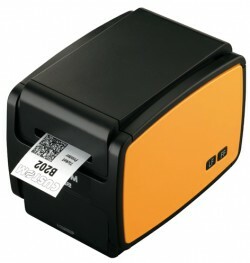 The printer can be equipped with the optional barcode scanner for validating pre-printed barcoded tickets and with the several RFID modules for HF and UHF. TK302 is available in AEA CUTE and CUPPS version for an easier integration in any airport sw architecture. The internal optional barcode scanner makes TK302 suitable for all ticketing applications where the fraud risk is very high and for enforcing the access controls. 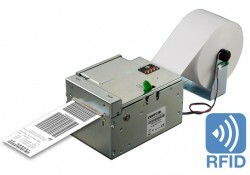 TK302 is very fast up to 200 mm/s printing speed in printing tickets. Different ticket width from 20 to 82.5 mm easily adjustable by the user. Paper thickness from 80 to 255 gsm. TrueTypeFont support, any language available. The external power supply is detachable to increase flexibility of installation. TK302 is complete with a display of 2 lines by 20 characters. TK302 has Ethernet interface with integrated built-in web server allowing to a complete remote monitor and real-time diagnostics of the printer.